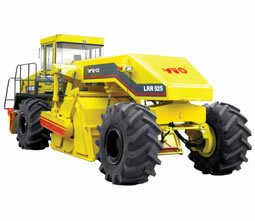 Our LRR525 road recycler is specially designed for the rebuilding of urban and rural road. This energy saving and environmentally friendly road construction equipment can mill and pulverize old asphalt road, and then mix the pulverized asphalt with stabilizer, cement or lime, and water or emulsified asphalt to pave new road base course. It can not only be used in road recycling work, but also be applied to mix lime, cement or asphalt with soil in road construction. 1. Our road recycler is equipped with powerful Cummins inter-cooling turbocharged diesel engine. The engine can offer 525HP power reserve. 2. Hydraulic all-wheel drive ensures the maximum traction. Hydraulic components are purchased from internationally well-known manufacturers. 3. The cutting rotor can move sideways, which enables the machine to perform well in close to the road curb. 4. The rotor is directly driven by hydraulic dual pumps and dual low-speed-high-torque motors with maximum torque force. 5. The driving cab can move towards to the left and right. This can effectively prevent the driver's visibility from disturbing of tree branches at both sides of road. 6. Rear wheels of our road recycler can be directly driven by two motors, dispensing with drive axle. The ground clearance is large, so the shaped road regenerating layer will not be damaged. 7. When the rotor lifts up, it will stop rotating automatically and the sprinkling system will stop spraying automatically. This can effectively protect the personnel nearby, save resources and keep construction site clean. 8. Heavy duty integrated brakes on front and rear wheels will automatically apply the brake when the engine is shut down. Travel brake of the hydraulic neutral position makes the operation much easier and safer. 9. The opening level of front and rear hood doors of rotor can be adjusted. The rotor is provided with optimum cutting and blending functions. The old asphalt road can be recycled, with minimum wear and power consumption. 10. Heavy-duty widen beam of the rear frame can be ballasted according to operating load, thus greatly enhancing the rigidity and operating stability of the construction machinery. 11. The rear wheel steering and the central articulated steering functions give the road recycler lateral crab travel function and high maneuverability. 12. The sprinkler system of our road recycler uses high quality hydraulic motor and water pump to ensure its high working efficiency. The water sprinkling amount is digitally displayed on the LCD. 13. The cutting depth of rotor, the hood opening level and other main control parameters are all displayed on the liquid crystal display board. Electronic control mode is adopted to control all the operating systems. There is camera on the working area, thus providing convenience for the operation. 14. The maximum cutting width of rotor is 2430mm and cutting depth is 0-400mm. Furthermore, the side movement of rotor is 200mm. As a professional road recycler manufacturer in China, we can produce not only road recycler, but also crawler tractor, road roller, harvester, and diesel engine, etc. Our products are manufactured in accordance with ISO9001:2008 and ISO14001 standards, so you can rest assured that they are all of reliable performance. Please do not hesitate to contact us if you are in need of any of them.